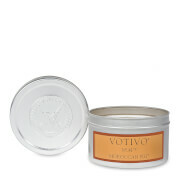 A natural soy blend wax candle in a convienent travel tin. Fragrance Description: Rush of Rose is an explosion of fresh, green Damascus Rose buds, surrounded by light, watery notes and soft woods that bring a youthful revitalization to the Classical Rose of yesterday. 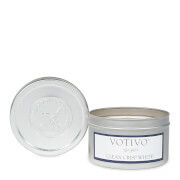 This candle smells soooo wonderful. It has a rich classic rose scent that is just beautiful. The scent is strong so I only need to light it for 10 minutes for the whole house to smell like a rose garden. The scent lasts awhile in the air after blowing out. It's worth the money. You can actually see the oils that are in the wax. Heavenly!